^ 世新大學. 一府三縣時期. [2015-03-25] （中文）. ^ 9.0 9.1 李晏甄. 指導教授：苗廷威. 台灣南北對立想像的興起 (PDF). 臺灣博碩士論文知識加值系統、國立政治大學社會學研究所. 2011-01 [2017-12-23]. （原始内容存档 (PDF)于2017-12-24） （中文）. ^ 臺灣各氣象站氣候資料. 中央氣象局. [2012-12-21]. （原始内容存档于2013-05-10）. ^ 熱破紀錄!台北38.7度 百年來6月最高溫 盆地熱島效應 38.7度台北史上第三熱 熱翻!全台10個測站 破當地最高溫紀錄 互联网档案馆的存檔，存档日期2016-06-02. ^ 熱爆！ 台北38.7℃ 史上6月最高溫 - 焦點 - 自由時報電子報. （原始内容存档于2016-06-04）. ^ 中央氣象局. August 2011 [2009-03-16]. （原始内容存档于2009-03-18）. ^ 近期各月人口統計資料 – 表八、各鄉鎮市區戶數及人口數統計表. 內政部戶政司人口資料庫. 2017-10 [2017-11-13]. （原始内容存档于2017-12-16）. ^ Wilfried Koch, Baustilkunde - Das Standardwerk zur europäischen Baukunst von der Antike bis zur Gegenwart (Gütersloh / München: Wissen Media Verlag GmbH, 2006), p. 404. ^ 張省卿，〈台灣總督府廳舍（1912-1919）﹕中央級與地方級官署建築之探討〉，《輔仁歷史學報》，第17期，臺北：輔仁大學歷史學系，2006年11月，頁291。Nov. 2006, Chang, Sheng-Ching.“Administrative buildings of the Taiwan governor's office, 1912-1919: a study of central and local administrative architecture”,“Fu Jen Historical Journal”, no. 17, Taipei, Department of History of Fu Jen University, p. 291. ^ 45.0 45.1 張省卿，〈以日治官廳台灣總督府（1912-1919）中軸佈置論東西建築交流〉，《輔仁歷史學報》，第19期，臺北：輔仁大學歷史學系，2007年7月，頁163-220。July 2007, Chang, Sheng-Ching. „Exchange between Eastern and Western architecture from the perspective of the central axis alignment with the example of the administrative buildings of Taiwan’s governor’s office“,“Fu Jen Historical Journal”, no.19; Taipei, Department and Graduate Institute of History of Fu Jen University, pp. 163-220. ^ 張省卿，〈台灣總督府廳舍（1912-1919）﹕中央級與地方級官署建築之探 討〉，《輔仁歷史學報》，第17期，臺北：輔仁大學歷史學系，2006年11月，頁285-353。Nov. 2006, Chang, Sheng-Ching.“Administrative buildings of the Taiwan governor's office, 1912-1919: a study of central and local administrative architecture”, “Fu Jen Historical Journal”, no. 17, Taipei, Department of History of Fu Jen University, pp. 285-353. ^ 47.0 47.1 中央研究院、林季平. 逢年過節，返鄉人潮為何一路向南？. 研之有物│串聯您與中央研究院的橋梁 (tertiary source). 2018-03-21 [2018-05-09]. （原始内容存档于2018-03-31） （中文）. ^ 張理國. 4300億治水破功 經濟部：南部晚治水預算少 勿從台北看天下. 中時電子報. 2018-08-30 [2018-09-09]. （原始内容存档于2018-08-31） （中文）. ^ 1999年12月－臺灣規模最大的防洪計畫完成. webcache.googleusercontent.com. 2018-09-09 [2018-09-09]. （原始内容存档于2018-09-09） （中文（台灣）‎）. ^ 《計劃城事：戰後臺北都市發展歷程》 林秀澧, 高名孝著 2015. ^ 張華承. 城鄉巡禮 » 台北城. 放眼看台灣. 行政院新聞局影音資料庫. （原始内容存档于2015-04-02）. ^ 全國意向顧問股份有限公司. 全國客家人口基礎資料調查研究. 行政院客家委員會. 2004年12月 [2010-01-17]. （原始内容存档于2009-03-18）. ^ 北市今年房價 平均漲逾10趴 - 財經 - 自由時報電子報. （原始内容存档于2013-01-01）. ^ 葉思含. 香港蟬連全球最貴商辦市場 比台北貴4倍. 自由時報. 2018-08-28 （中文）. ^ 楊筱筠. 瑞銀全球物價報告揭密 台灣物價亞洲第三貴. 經濟日報. 2018-05-31 （中文）. ^ 勞動統計月報 勞動力狀況－按地區分. 行政院勞委會. （原始内容存档于2006-06-30）. ^ 劉榮. 北市街頭藝人會考 秀絕活. 自由時報. 2008-11-24. （原始内容存档于2009-03-18）. ^ 吳仁捷. 青春無敵到火車站～～～尬舞！. 自由時報. 2008-09-01. （原始内容存档于2009-03-18）. ^ 吳仁捷. 學者：應適度開放閒置空間. 自由時報. 2008-09-01. （原始内容存档于2009-03-18）. ^ 誠品網路編輯群. 《街舞狂潮》導演蘇哲賢專訪：追逐夢想，重要的是過程中的熱血，而不是結果. 誠品站. 2010-09-15. （原始内容存档于2014-09-10）. ^ 陳曉宜. 禮讓單車北市推廣友善空間. 自由時報. 2005年10月17日 [2011年2月28日]. （原始内容存档于2009年3月18日） （中文（繁體）‎）. ^ 林恕暉. 騎樓整平成效好 其他縣市擬推動. 自由時報. 2009年3月10日 [2011年2月28日]. （原始内容存档于2009年3月18日） （中文（繁體）‎）. ^ 洪敏隆. 公共自行車停車柱 被民眾卡位. 自由時報. 2009年3月10日 [2011年2月28日]. （原始内容存档于2009年3月18日） （中文（繁體）‎）. ^ 洪敏隆. 捷運新電聯車亮相 新增車廂內監視攝影設備及自行車停放區. 自由時報. 2005年12月28日 [2011年2月28日]. （原始内容存档于2009年3月18日） （中文（繁體）‎）. ^ 陳金萬、陳永朋、蘇士雅、楊文琳、潘云薇. 公共圖書館統計：104年臺北市每人購書經費與每人擁書量最多. 書香遠傳. 2016-09-05 （中文）. ^ 臺北市政府主計處 市政統計週報 (第890號) 互联网档案馆的存檔，存档日期2017-05-16. ^ 蔡永彬. 哪個縣市公定「古蹟」最多？ 7成2青少年錯答成台南. 蘋果日報. 2019-01-15 （中文）. ^ 孫彬訓. 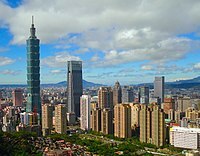 萬事達卡報告：台北躋身全球第15大最佳旅遊城市. 工商時報. 2016-10-03 （中文）. ^ 臺北市法規提案流程查詢系統 - 法規提案詳細內容 - 修正臺北市市徽市旗設置辦法 - 市政會議審議通過 互联网档案馆的存檔，存档日期2014-01-16. ^ 北市府網站管理員. 認識臺北. 2009-04-14. （原始内容存档于2015-06-16）. ^ 周志豪. 協會型國際會展會議排名 台北被曼谷、東京超越. 聯合晚報. 2018-07-14 （中文）. ^ 橫濱市的國際交流. 横浜市国際局国際政策部国際連携課. [2018-08-12] （中文（台灣）‎）. 張省卿：〈台灣總督府廳舍（1912-1919）﹕中央級與地方級官署建築之探 討〉，《輔仁歷史學報》，第17期，台北：輔仁大學歷史學系，2006年11月，頁285-353。Nov. 2006, Chang, Sheng-Ching. 「Administrative buildings of the Taiwan governor's office, 1912-1919: a study of central and local administrative architecture」, 「Fu Jen Historical Journal」, no. 17, Taipei, Department of History of Fu Jen University, pp. 285-353. 張省卿：〈以日治官廳台灣總督府（1912-1919）中軸布置論東西建築交流〉，《輔仁歷史學 報》，第19期，台北：輔仁大學歷史學系，2007年7月，頁163-220。July 2007, Chang, Sheng-Ching. „Exchange between Eastern and Western architecture from the perspective of the central axis alignment with the example of the administrative buildings of Taiwan’s governor’s office「, 「Fu Jen Historical Journal」, no.19; Taipei, Department and Graduate Institute of History of Fu Jen University, pp. 163-220.